Reverend Freakchild - Vocals and Guitar, Chris Parker - Drums, Hugh Pool - Lap Steel, Backup Vocals - The Mulebone Singers, Video Produced by Chris Kepple, Shot and Edited by Nat Kramer & Juan Ignacio Stewart, Dancers: Anyeli Arias & Sam Krezinski, Production Associate: Nolan Kemp, Color Correction by Nat, This single 'All I Got is Now' is included on the album Hillbilly Zen-Punk Blues - Recorded at Excello Studios Brooklyn, NY, Mastered by Scott Hull at Masterdisc, Copyright 2016 Citizen of the Universe Music. These songs of faith, hope, and love, are for everyone seeking shelter from the storm. On Saturday Night & Sunday Mornin' too! Ramblin' Jennings - Preachin' the Gospel Blues with Declamatory Vocals, Wailing Blues Harmonica, and Slide Boogie Guitar. All songs by © Ramblin' Jennings except John the Revelator Traditional arranged by Ramblin' Jennings. 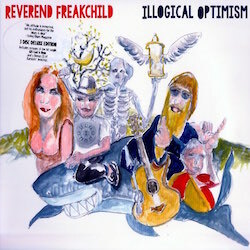 Reverend Freakchild is not your everyday average bluesman. Sure, he can play the blues in all of its forms, but his albums are way out there in the blues realm: they confuse old people, make little kids cry, and cause fellow musicians to grin from ear-to-ear.